Dangerous Streets. Which is the city that Hollywood movies have captured the most? One doesn’t have to think twice – that’s New York. The city that everyone admires, wants to be there, to achieve the top of the world, to bite the big apple. The city that never sleeps. The one that always makes you want to go on and touch the sky. But, not only success happens there. Criminal, gangs exist there also. Where there are money, there are tough guys, as well. Criminal and frauds bloom on the streets of New York. Policemen have full hands of job. If one wants to feel the excitement of playing detective, the big apple is the right place. Today we have such a brave lady. Sharon is detective who works in the New York Police department. She has a new especially provocative case with weapon trafficking from a local gang. That team brought fear into the local people living around. They are racketeering people. For Sharon this is extremely important case, because she herself comes from that part of the town and her friends from the childhood time still live there. Once for all, Sharon wants to put in jail the members of this evil gang and her neighborhood to become again the happiest place for people to live. 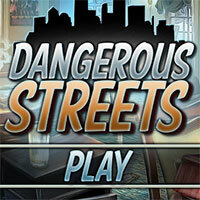 Dangerous Streets is a free online hidden clues game on Hidden4Fun.